I write now from a Luftansa lounge in Frankfurt, Germany, as we await our flight to Uganda later today. It’s good to catch our breath before diving into a full ministry schedule in Mbale. Backing up to the other side of the world, we spent 9 wonderful days in Kauai to finish out February and usher in March. For the fifth year in a row, we were privileged to do a marriage conference at the Kalaheo Missionary Church (KMC), sponsored by Global Algae Innovations’ foundation, Stepping Forward International. We love the heart and vision that the founder and CEO of Global Algae Innovations, Dr. Dave Hazlebeck and his wife Debbie, have for hosting this conference each year, fulfilling their commitment to strengthen marriages and improve communities. Partnering with Kahu John and Paula Zimmerman (senior pastor of KMC), the marriage conference, complete with childcare, was well-attended and deeply appreciated. We were also privileged to teach at the Sunday morning service to an enthusiastic and responsive full house. We love this church and the passion of their leadership. It’s a happening place and God is doing great things through this congregation. Besides three days of ministry, we had R and R for three days on either side of the weekend. We did a fair bit of hiking, sea glass hunting, hanging with friends, and exploring new areas. We saw beautiful rainbows, flowers, sunrises, sunsets, and seascapes . . . but no whales. Hardly a complaint, just an observation. The time was just what we needed in the midst of so much travel. Sea glass hunting with the Hazlebeck clan: Dave and Debbie (the parents), David and Emily (the newlyweds), and our dear friend Wendy Turney, who just happened to be on the island that week. The crew at Kalaheo Missionary Church. The top photo is the Booye family, whom we’ve grown to love over the years. They’re all serving in ministry together and living the gospel in very practical ways. Lunchtime at the conference . . . bring those 50+ kids from childcare to eat with their parents! More Kauai . . . such sweet memories and wonderful fellowship. Each year we’ve enjoyed getting to know Bill and Susan Gates; Bill serves on the IVCF Board. We especially enjoyed hiking "Sleeping Giant” with them this year. From Kauai, we flew to Los Angeles. First stop, Santa Clarita. We were so happy to be able to see Brandon play in his last basketball game of the season. Coached by Brandon’s dad, Gabe (a.k.a. our son-in-law), they had a great season learning the fundamentals of basketball and of good sportsmanship. We had seen their second game of the season and were very impressed with the growth and improvement reflected in their last game. Basketball fun . . . but first, donuts for fuel! Ana discovered a few treasures under the bleachers when the game didn’t hold her attention. ﻿The purpose of being in Santa Clarita was to speak at the Heart of the Canyons’ Marriage Conference. Returning for the second time in three years, we were delighted to reconnect with this warm, open congregation lead by Jim and Carol Ryan and Doug and Kelly Hart. It’s so rewarding to hear how God meets different people in different ways through the teaching . . . Such an affirmation that the Holy Spirit is the One who changes lives and hearts. The congregation at Heart of the Canyons has been led by Jim and Carol Ryan for over 30 years and they are well loved. ﻿Down to San Diego we zoomed—in our imaginations, only, since the 2.5 hr trip took 5 hours that Saturday afternoon :-( —but we still got there in time to make a late dinner for my mom who was eagerly awaiting our arrival. We feel so privileged to seize these moments with her! She has a grateful, loving heart and it is truly a joy to spend time with her. My dear, dear friend Wendy Offield drove down from Laguna Beach to spend one of the days with us and we couldn’t have had a sweeter time. Our “field trip” to Coronado where we lunched at the Hotel Del Coronado was perfect in every way as we talked (and ate) our way through the day. Our almost four-decades-old friendship grows deeper year by year and is shared by my mom, too. Such a treat to spend the day together! Great moments on Coronado Island as well as a gorgeous sunrise to reward an early start one day. We drove back to Santa Clarita to speak on Tuesday, March 12, for Grace Baptist Church’s “Fantastic Fours” ministry. The moms seemed to really appreciate the thought-provoking talk on media . . . an area that is challenging everyone these days! The next day, we spoke at Crossroads Church’s “Momsense” and they, too, really embraced our talk on raising kids. We love speaking to moms’ groups! ﻿Just like that, we were off to Scottsdale, AZ, for CURE’s President’s weekend. We so love the work of CURE (www.CURE.org) as the organization is committed to meeting physical and spiritual needs of children around the world. This conference is so inspirational: great teaching by Dr. Joe Stowell, encouraging stories “from the field,” interesting insights from some of the CURE physicians, and phenomenal worship led by Brenton Brown and his band. Besides all of that, we got to hang out with many dear friends (including Derek and Julie), do a bit of hiking, and relax a bit in a beautiful setting. We left refreshed. In the top photo, we stand with Derek and Julie, and with Dr. Emma and Florence (Dr. Emma is one of the pediatric neurosurgeons at the Mbale hospital.) Lower right side is Dr. Joe Stowell, teaching. He is such a gifted teacher! I just happen to “run” in to Brenton Brown and got to personally thank him for leading us to Jesus during worship, vs. leading us to himself. He’s written some of our favorite contemporary songs, including “Everlasting God” and “Lion and the Lamb,” and did a phenomenal job at the conference. ﻿We actually made it back to San Diego for a couple of days after the CURE conference ended and were able to get a few more important things done for mom, like a visit to her dermatologist and to her hearing aid specialist. We had lots of fun in between appointments! 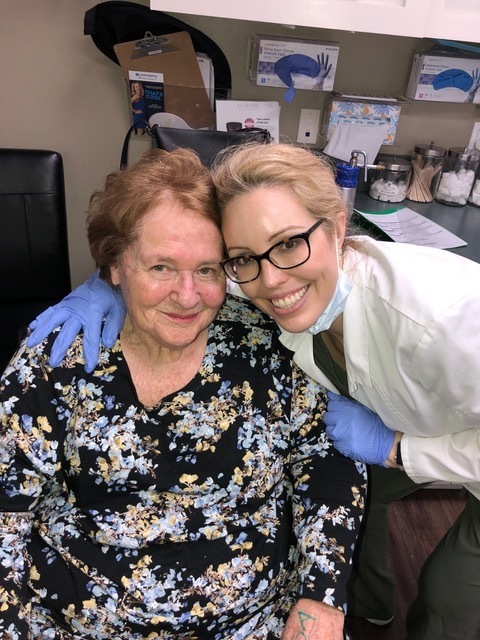 Mom and her dermatologist, Dr. Jennifer Rulan. And then . . . we drove to Palm Desert to speak at the Thrive Southwest Leadership Conference. What. Fun. Anything that has Ray Johnston’s DNA promises to be full of energy and lots of fun and that was certainly true about this conference. We loved being a part of this high-octane experience, the highlight of which was hearing Luis Palau speak. Luis defies his age (84) and his condition (stage 4 lung cancer, diagnosed 14 months ago). His passion for Christ was as deep as ever as he proclaimed the gospel without apology. So motivating!! We also had some great fellowship with many dear friends at Thrive and we were thrilled to have Lisa with us for two of the three days. She introduced us at one of our workshops and took care of the book table. Everything is better with Lisa around. Dinner with Doug and Kelly Hart and Lisa . . . spending time with friends is one of the best parts of what we do! Dinner with Ray and Carol Johnston is always a treat. ﻿From Palm Desert, we drove back up to Santa Clarita for a last visit with Kari and Gabe and crew, facilitated by speaking for Date Night at Crescenta Valley Church. Spearheaded by Bryan and Karen Miller, longtime CBS family campers, the evening included two talks, yummy desserts, and some fun games. We thoroughly enjoyed this new-to-us congregation and really felt the connectedness of community among the congregants. It’s one of the advantages of a smaller church; people seem to know one another. It was such a positive “body life” evening and the special joy for us was being with the Miller family after a 2.5 year lapse. Bryan and Karen Miller are very involved in marriage ministry at Crescenta Valley Church. They did a great job hosting “Family Feud” as well. ﻿Meanwhile, a drama was unfolding in the Garcia family as Micah, who had sustained an injury under his tongue when the end of an umbrella somehow got lodged in his mouth earlier in the week, had become very sick by Friday night. Early Saturday morning, Gabe and Kari took him to Urgent Care (for the third time since the injury late Monday) and from there they went to an ER at another hospital for a CT scan, which confirmed an abscess under his tongue. Off to the hospital where emergency surgery was done to drain the abscess. Thankfully Lisa and we were in town to help with the other two children and to support Kari and Gabe in the hospital. I ended up staying with Kari and Micah in the hospital the second night so Gabe could be with the kids and Lisa could return home. We were all delighted when Micah was released Monday afternoon and he’s well healed up now, thank the Lord. It was a very scary, “we hope this doesn’t happen again” freak accident. On our way to speak in La Crescenta, we were able to drop a suitcase off for the Garcias as the CT scan confirmed that surgery would be needed to drain the abscess. Micah was one sick little guy at this point. As concerned as Brandon and Ana were about Micah, they managed to forget their fears temporarily while enjoying lunch at In N Out Burger. The next day, though, a hospital visit was in order and Micah was very happy to see his siblings. It was very good to get back to Bedford early March 27, exactly six weeks after leaving on this Super Trip. Within hours of leaving our three grandchildren in California, our other two arrived in Bedford (with their parents, of course!). Pure gift. Our time with the Johnsons was very limited, between lots of counseling and two speaking engagements, but we squeezed all we could out of “unscheduled” moments. Off to Providence for the weekend, where we spoke for the second year in a row for the Christ Community Church Marriage Retreat. We fell in love with this group last year and felt like we had found a “hidden gem” of a church family there. We feel that way even more this year. 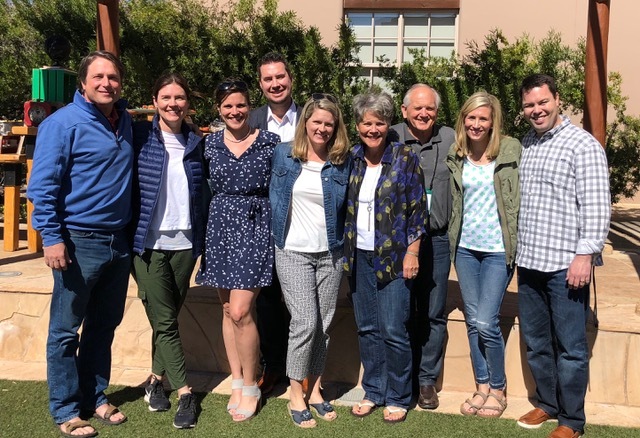 Under the godly leadership of Rick and Ann Luz and David and Alli Mackall, this diverse congregation IS a family, committed to growing in Christlikeness. They love Jesus and each other and are making such a difference in the Providence area. It was a true joy to be back with them. Rick and Ann Luz are investing their hearts and souls in faithfully serving this congregation at Christ Community Church. This diverse, multi-generational, multi-ethnic congregation is thriving as the family of God. And finally, one last event before our departure for Uganda . . . The second annual Armenian Couples’ Date Night. The brainchild of Badvelli Avedi and Arpi Boynerian, couples from all seven evangelical Armenian congregations in the greater Boston area are invited to spend this evening celebrating God’s good design for marriage. Dinner (how understated to call it that: a fantastic Armenian feast was served! ), “The Newlywed Game,” and two talks by us rounded out the evening which was very well attended. This “uncommon” event has been enthusiastically embraced by initially wary parishioners and the Boynerians are hoping it will continue to gain momentum. It was a delightful evening in every way. Top photo, we stand with our dear friends the Bilazarians; lower left is of the committee responsible for making this event happen. Phew!! That even made me tired recounting this Super Trip!! We are so very thankful for safe travels, for good health, for H.I.M. team members who keep things going while we’re out and about, and for friends around the world who love and support what we do and help make it happen. But most of all, we’re thankful that God goes before us and is with us each step of the way. We are so aware that we cannot change hearts, but we are so thankful that we can proclaim the gospel as it applies to marriage and family with confidence that He will do the rest. One closing thought: The Super Bloom happening in California is available to hundreds of thousands of people, but it takes some effort to go to see the wildflowers. Our daughter Lisa took the photo that opens this blog post, as well as this one, this past weekend when she and her cousin and aunt and uncle drove hours to see them. They will tell it was worth every bit of energy, time, and intention to be able to experience this incredible phenomenon. Paul and I drove within an hour of seeing the same fields while we were zigzagging over southern California this past month, but we didn’t see what Lisa saw because we didn’t take the time. This was the best we could do, snapping a photo from inside our moving car as we sped to speak at Thrive Southwest. Fortunately, though California's “Super Bloom” will fade, the opportunity to know Him more and more will be available for as long as we have breath. And that’s what I want to be about.